What Makes Bablic Unique Vis-a-vis Other Website Translation Services? The demand for website translation services has risen over the last decade. The primary reason for such a surge is the sharp rise in the number of non-English users on the internet. In fact, the rise of regional languages on the internet as a result of globalization has been so prolific that in the US alone, the translation industry is projected to grow by a whopping 42% from 2010-2020. Further, the data highlighting that more than 70% users prefer browsing in their regional language and more than 46% never buy anything unless it is available in their mother tongue drove businesses to get their websites translated in order to target their prospective customers. In this scenario, it was inevitable to witness a boom in website translation software across the globe. However, not many have been as promising and unique as Bablic. 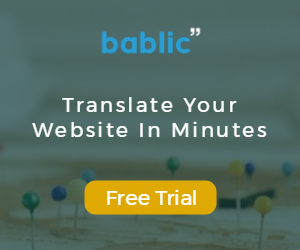 This blog discusses the different features that make Bablic one of the most sought-after website translation solutions in the last few years. Unlike many other translation services, Bablic offers much more than just plain and simple translation. Bablic helps localize websites by diving deeper into the details. Many consider localization and translation as the same but they are actually very different. Translation is indeed the first step toward localization, but the latter includes a bit more. Localization, in short, is the process of making the user connect with an entire website not just linguistically, but emotionally, culturally and mentally too. This means one needs to change the look and feel of the website in terms of images, videos, terminology, fonts etc. This is where Bablic comes in handy. Its visual editor allows one to make all these changes to a website through a visual, user-friendly interface, thereby making any localization project a breeze. Integrating Bablic into one’s website is effortlessly simple. In fact, it is not just simple, but quick too. One does not have to bother about any complex programming or coding in order to get started with Bablic. All one has to do is to copy and paste a one-line code in the website and that’s it. With Bablic, one can literally translate a website in minutes. 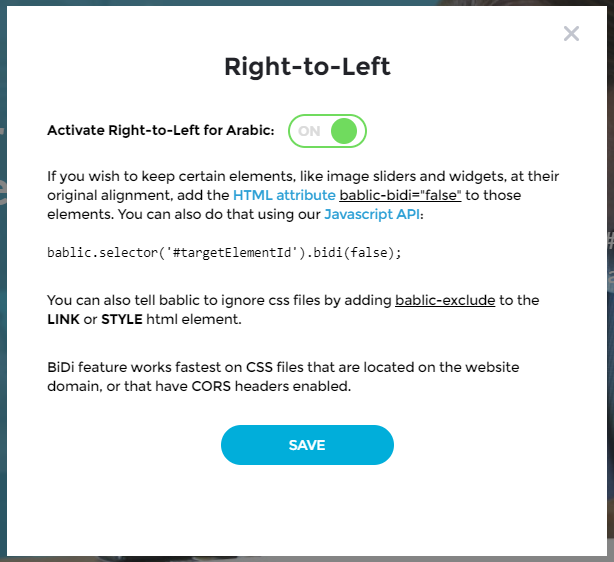 Many software solutions are capable of translating a website from one language to another; however, what makes Bablic different is that it comes with the option to switch page direction. This becomes indispensable because if your source language is written in the Left to Right direction and the translated language in the opposite way, the whole output would appear incongruent and unpleasant to the eyes unless one switches the page direction. Switching a page’s orientation is considered a daunting task for CSS developers. With Bablic all it takes is to flip a switch. One of the reasons why Bablic has become so popular in the past few years is because of its pricing. Since it has been especially designed to cater to the needs of small and medium-scale businesses, Bablic has been fairly priced and one can add a new language to one’s website for as little as $24 a month. To sum it up, Bablic has some very rare features compared to the other available website translation software, which makes it stand out. On top of this, it is cost-effective and easy, thereby causing businesses to gravitate toward it. If you are still unsure, try adding one language to your website for free and see the result for yourself.